JEFFERSON CITY, Mo. - New Haven started off Saturday’s Class 1 Track and Field State Finals with the boys 4x800 meter relay team (Nathan Ford, Jonathon Stone, Kevin McDowell, and Dominick Pataky) finishing in dramatic fashion to capture 3rd place, running a season best of 1:49.78. On the girls side the 4x200 relay (Stephanie Russo, Emma Engelbrecht, Nichole Zeitzmann, and Molly Munsinger)team finished in 2nd place with a time of 1:49.78 falling short by just .17 seconds. The 4x100 (Stephanie Russo, Hanna Fitts, Nichole Zeitzmann, and Molly Munsinger) finished in 5th place with a time of 52.94. Taylor Covington took 7th place in the 400 meter and 7th in the 800 meter. 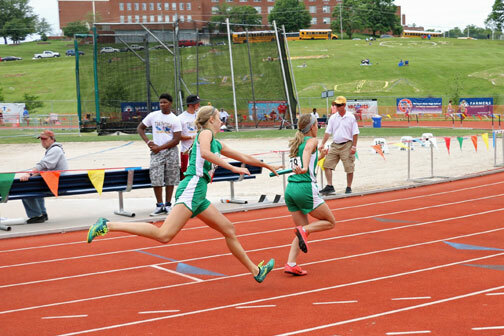 The Girls Track Team finished 4th overall as a team and the 4x400 won their second straight state championship.